The third international knight festival Just Out was held from August 25th to 27th, 2017, in the magnificent Monastery of Manasija, near Despotovac, in memory of almost 600 years since Despot Stefan Lazarević built one of the most beautiful medieval fortresses with the Holy Trinity Church. The hosts of the manifestation are White Eagles, knights from Belgrade, who hosted about 400 participants from 19 countries (France, Russia, Ukraine, Romania, Bulgaria, Hungary, Republic of Srpska, Croatia, Montenegro, Slovenia, Denmark, Sweden, Belgium, Armenia and Iran), among which were the TO Gračanice and the knights association Order of a Dragon from Gračanica with their members. During Just Out festival, TO Gračanica and the knight's association Order of a Dragon took part in the documentary film about Despot Stefan Lazarević. Also, the medieval equipment, clothes and the armor of Miloš Obilić, belonging to the knight's association Order of a Dragon, were used for documentary film recording. The actor who interpreted the Despot Stefan Lazarevic in this documentary, was recoded as he wears the armor of Miloš Obilić and two medieval clothes of kings. About 50 medieval tents were raised in the medieval camp area of Just Out festival. At the camp area three tents of the Order of a Dragon were raised and a knight dressed in armor Milos Obilić has attracted great attention of all visitors of the festival, which took pictures with him and they had the opportunity to try out parts of this armor. For the youngest visitors of the festival, members of the Order of a Dragon association organized workshops, in order to have more fun. On the archery tournament at Just Out festival, three disciplines were organized: shooting a standard target with 5 arrows, shooting an arrow standing vertically sloped into the land with 3 arrows and shooting golden coin with one arrow. About 30 experienced archers participated in the archery tournament, among them four members of the Red Dragon from Gračanica. 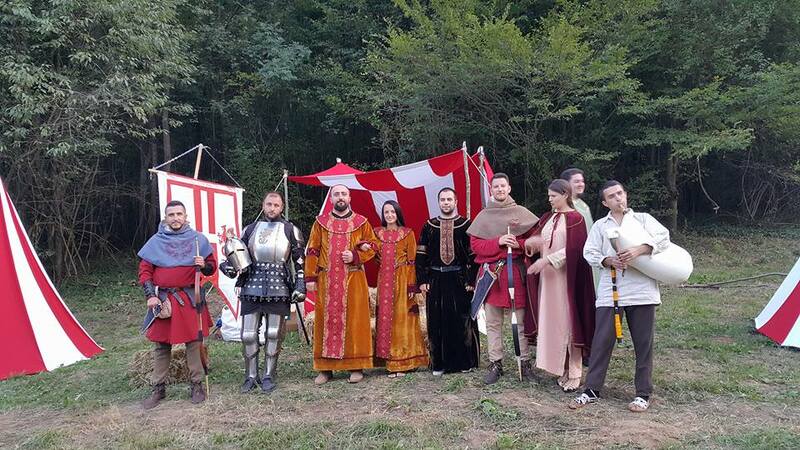 Despite the strong competition, Nemanja Mihajlović from Gračanica won the first place at the archery tournament, and thus contributed to the greater popularity and better recognition of the knight's association Order of a Dragon. As a prize for the first place he received an archery cap which is a part of medieval archery clothes. At the opening ceremony of the festival, the President of Serbia - Aleksandar Vučić, has received ceremonial medieval sword from the president of the White Eagles association - Bojan Tasić and the member of Order of a Dragon in armor of Miloš Obilić - Dejan Popović. At the Just Out festival, the members of the Red Dragon promoted the third international knights festival SHIELD, which will be held in Gračanica from 22 to 24 June 2018. Director of TO Gračanica, Boban Petrović, in order to increase the number of participants at the third SHIELD festival in Gračanica, negotiated with representatives of all foreign and domestic participants at the Just Out festival. There is a great interest in participating in the SHIELD festival in Gračanica, and therefore preparations for the festival will begin in early November in order to provide all the necessary funds for their participation. TO Gračanica and the Order of the Dragon are especially grateful to the Municipality of Gračanica on the provided transportation and to the knights association White Eagles for cooperation and invitation to the festival in the Monastery of Manasija. More pictures from this festival can be viewed on our Facebook page.